use the right words if she makes the effort. All in all, she can be quite a contradiction. Check out a hand photo here and here. The main characteristics on her hand like her strong Saturn finger, the low-set Mercury finger, developed Mount of Jupiter, and a change in the shape of her Headline as it goes along (and between her left passive and right active hands) are significant. And the square tips of her fingers, the broad palm, the developed Mount of Venus, the fine texture and lines and the well-shaped Heartline tell us of her pragmatic, warm, affectionate, and sensitive nature. Miley, although fairly direct and blunt, is not always straightforward (as seen from the shape of her thumb and Mercury finger). She is a shrewd customer alright, and also tends to be fickle. This could affect her personal life. As she gets into adulthood, she becomes more cautious, less bubbly, and more guarded, and this affects her outward persona. In her photographs, Miley smiles a lot, but she is hiding behind a seriousness beyond her years. A hard-working personality, and intensely focused. There is the melancholy deep inside of her, and an inner desire for solitude. She can be moody as well. Although she is not mentally weak, she is not exceptionally strong either and needs to keep this in mind and not push herself too hard or expect too much from herself. Burn-out is a possibility with a personality such as hers. An intensely strong drive and ambition, but without the matching stamina required in the long run. A change in her thinking is evident as she nears her mid-twenties and this is the time when the serious aspect of her persona becomes more obvious (seen from her Saturn finger and Headline). Miley is likely to go through a difficult period in her early thirties although this is preventable. She has a reasonable amount of talent but what she does with it in the future is entirely up to her. She is basically a sensible, focused person, and can make a smooth transition into adult fame if she does not stress herself out too much, or expect too much from herself. It is very important for her to choose a good business manager because her hand shows a lack of instinct in this department. It is also important for her not to mix up her personal and professional lives and not let her personal crises affect her work. Note: Miley Cyrus is an American actress and singer. She is the lead actor/singer in the television show Hannah Montana on the Disney Channel. 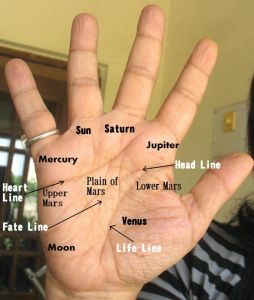 First of all hat's off to your great efforts in analyzing the hands of celebrities and also helping amateurs learn a great deal about palmistry. For the past two days I am reading & following your posts. I must add they are genuinely superb and brilliant works on palmistry found in web world. I have a question!Is it necessary to analyze the right hand of both male and female if the right hand is prominent and active hand. As the traditional palmist always stresses on right for male and left for female despite the fact of active hand in an individual. this is very interesting! she seems like a complicated person indeed! I am sorry I have published my comment as anonymous. Hope you don't mind. Anonymous, thanks. About the palmistry, well, there are a lot of things that traditional palmists did right. They set down certain basic principles and there were several schools of thought, much like it is in psychiatry. However one has to think of the traditional thinking more as a base and not take all the points as necessarily right. Also, even traditional hand readers like Benham have always stressed on the importance of the active hand being the one to read for both sexes, as it shows the current state of mind. I have read hundreds and hundreds of hands and have never found this premise to be wrong. And why should it be wrong. Whether male or female, we belong to the same race. DI, that is an interesting question. True, an inner energy which is motivated by ambition and sometimes greed, can drive oneself beyond one's capacity. It can make one ignore certain signals which the body and mind give to us to slow down. If one is mentally strong then one can avoid a mental break-down, but such people do have a break-down of a different kind maybe some years later. Maybe a dissipation of energy,depression, or even disease. I think modern life puts a lot of pressures on us, far more than our ancestors have had to handle. Successful people have it worse I guess. Sometimes I wonder if that is God's way of ensuring equality to his creations in this world. The most successful people have had to face some of the biggest crisis at some point of time in their lives. I know we all need to, but the scale of success seems to be in vogue with the scale of difficulties. But then, I really can't say these things with confidence as they are plain assumptions.